I love chicken with vegetables. 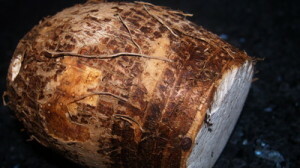 Taro (kochu) is a unique vegetable, it goes well with chicken. Any Taro recipe (stem, leaf, small taro or taro) needs to be spicy and be careful to cut it (for stain and it can make your skin itchy). Hard part of cooking taro cut the skin of taro, need to be careful cut thick skin and don’t not keep any brown part of skin. Hope you will enjoy very traditional Bangladeshi vegetables (Kochu) which is quite available in abroad. 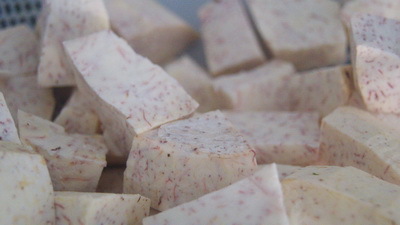 First cut skin of taro and cut into large pieces(check the picture). Need to cut skin not peel. Otherwise Taro could be itchy. Wash it and keep aside. Heat the pan with oil on medium heat and add sliced onion, cinnamon, cardamom and bay leaf. Saute it till it becomes soft and add turmeric, chilli, coriander, ginger, garlic,1 teaspoon salt and onion paste. 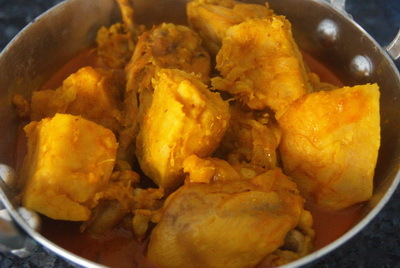 Cook it till oil comes out, add chicken pieces and cook it about 10 minutes and stir occionally. Add taro pieces, stir it and cook for 2 minutes. Add 5 cups water and stir it. Cook it under close lid till taro becomes tender. Check the salt and add toasted cumin powder and turn off the heat. 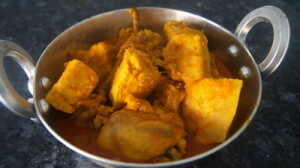 Serve Chicken with Taro / Kochu Murgi hot with rice. I love all of the recipes of yours. All of the recipes are neat and clean; also easy to follow. I will try this recipe soon.